Following in the steps of Times Internet Ltd, the digital arm of the media house Bennett, Coleman & Co. Ltd (BCCL), HT Media Ltd has also launched an augmented reality app. The app, 'Arplus', is an augmented reality app that enables its users to interact with the Hindustan Times newspaper by providing rich media content. And for those who don't already know, augmented reality is the concept of superimposing virtual content (such as 3D graphics) on top of a view of the real world. The app can be downloaded free of cost and is available on the Android and iOS platforms, but since it requires an active internet connection to function, data charges could be applied. 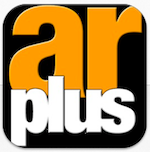 For using the app, users will have to open and point it to a picture/content with the 'Arplus' logo. The app will scan the picture/content using the smartphone's camera, and in return provide the user with multimedia content (pictures, videos, etc.) related to it. According to the app, it will offer the same for newspaper ads, magazines as well as websites. We tried field-testing the app, but couldn't find any picture with the Arplus logo in today's Hindustan Times newspaper (if you are able to find any, do share the page number and story name with us in the comments section below) for the same. Probably the company is still in the process of adding the content, which could explain the lack of promotions of the app. Last we checked, the app had been downloaded between 10,000-50,000 times from the Google Play store alone (iOS download numbers were not available). Interestingly, the app has received mostly mixed reviews, getting either 5 stars or 1 star rating from the users. In comparison, Times Internet claims that its augmented reality app Alive, which was launched late last month, has already clocked 2.5 lakh downloads. The app also saw some three lakh augmented reality interactions on its launch day, the company claimed. Note that the Alive app is also available free of cost (data usage charges applicable) and is available for the iOS, Android, BlackBerry platforms and some versions of Symbian handsets. 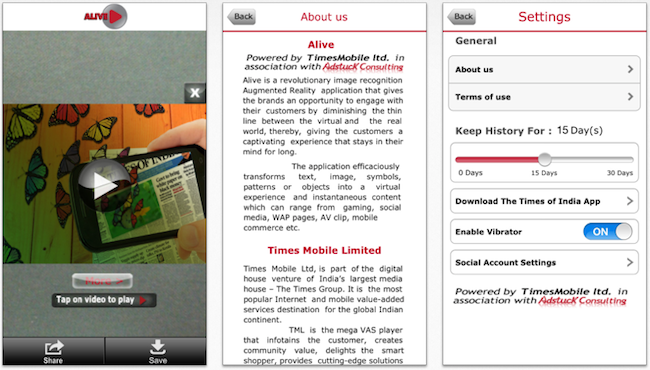 The app allows its users to scan printed materials with the Alive logo on The Times of India newspaper (with the smartphone camera) and gain multimedia experience through news content, videos, picture gallery, polls etc. While the Alive app is only available for The Times of India, Bombay Times, Delhi Times, etc., the company is planning to integrate it across all of its media outlets. "The app will be soon available for The Economic Times and other language newspapers," said Satyan Gajwani, CEO of Times Internet. "Unlike others who integrate their augmented reality apps with just ads, we are integrating it with exclusive content," he added. A Juniper study predicts that augmented reality apps will generate $300 million revenues in 2013 and will hit $5.2 billion in 2017, an increase from the estimated $82 million in 2012. The report also states that more than 2.5 billion augmented reality apps will be downloaded by 2017, a majority of which will be games that use augmented reality to add an additional layer of interaction to content. We can understand the use of AR in games, e-commerce sites, etc., but unless a large volume of content is available in the newspapers that support these apps, their adoption could be slow. Also, with a number of new age tech savvy people using mobile apps (TOI, HT etc. already also have their own standalone mobile apps for news) and news sites for getting their daily news dope instead of the traditional newspaper, is there really a need for such an app? That is all for now, but stay tuned for a one on one between the apps once we can get our hands on a story with an Arplus logo. Keep track of this space for more on that.